In 1993, Azerbaijan issued two souvenir sheets celebrating the 70th birthday of President Heydar Aliev (Scott # 394b, 394c). 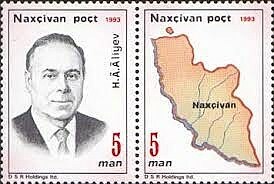 The scarcer of the two sheets (Scott #394b) contains a spelling error: the President's birth city, Naxcivan, is mispelled "Haxcivan" on the map pictured on the second stamp. 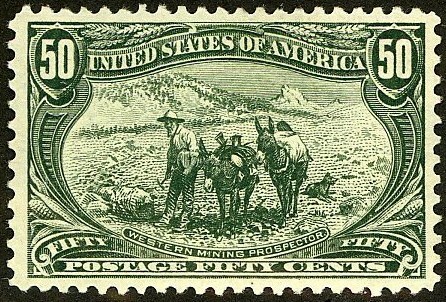 4,000 of the error sheet and 25,000 of the normal sheet (Scott #394c- pair from sheet shown) were issued, and Scott '14 prices them at $90.- and $15.- , respectively. I believe that both sheets are worth accumulating, although the error sheet is the more promising of the two. It's worth keeping an eye out for the error sheet mis-classified as the normal one. Azerbaijan is an oil-rich nation of about 9 million people, which also has significant reserves of natural gas and various minerals. Agriculture and tourism are also important to the Azerbaijani economy. The country shares all the problems of the former Soviet republics in making the transition from a command to a market economy, but its energy resources brighten its long-term prospects. It has begun making progress on economic reform, and old economic ties and structures are slowly being replaced. Annual GDP growth has averaged a stellar 16% over the last 5 years, largely based on the frenetic development of the country's oil wealth - an estimated 7 billion barrels of reserves. Phila-Trivia: By Gum! It's Stuck!